Life changed in an instant for Ondelee Perteet. When he was just 14 years old, Ondelee, of Chicago, Ill., was attending a birthday party when some people started to get rowdy. Ondelee tried to break up a fight and one of the young men pulled out a gun, shooting Ondelee in the face. The bullet went through Ondelee's jaw, breaking two bones in his neck and severing his spine. Ondelee, a promising swimmer who wanted to be like Olympian Michael Phelps, became a quadriplegic. 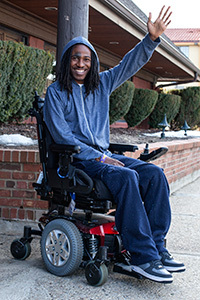 Now age 18, Ondelee uses a Quantum Rehab® Q6 Edge® Power Chair. "I like my chair because it allows me get around easier," Ondelee said. "It helps me out a lot. I like the speed of it and I like the way it looks." 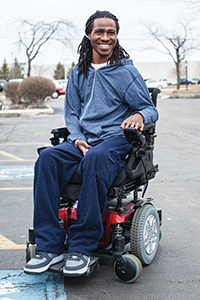 Ondelee said that before he got his Q6 Edge, his old power chair kept breaking down which caused him to miss school. But now thanks to his Q6 Edge, Ondelee is all caught up with his schoolwork and just graduated from Wendell Phillips Academy High School in Chicago. Ondelee also keeps busy giving motivational speeches to his peers around the Chicago area. His schedule is booked up with many speaking engagements from schools to community events where he tells his story and speaks out against inner city violence and what it does to people and their families. This past March, Ondelee spoke to over 2,000 attendees at a Chicago event held by Nonviolence: No Higher Calling (NONVIO). NONVIO, a movement launched by the Art of Living Foundation, is committed to counteracting the 10 million acts of violence perpetrated in the U.S. every year. Ondelee hopes to one day tour the country as a motivational speaker. He says he will speak wherever he can and to whomever will have him. "I give people an opportunity to see up close and personal the ramifications of gun violence, and give hope to those who have been affected by it," Ondelee said. "But I also feel that I have the voice to help other people and can inspire them to find a goal and reach for that goal. I say to people that they should never let anyone tell them that they cannot do something. True to his words, Ondelee follows his own advice. Although doctors told him that he would never move his arms or legs again, Ondelee now has good movement in his right arm and has some movement in his left arm. He can also take steps unassisted without a cane for short distances. This summer, Ondelee hopes to once again get back in the water and swim in physical therapy at Schwab Rehabilitation Hospital. "When I look at my son, he has taught me how to live life, respect life, and enjoy life," said Deetreena Perteet, Ondelee's mom. "He gives me a different outlook on life." 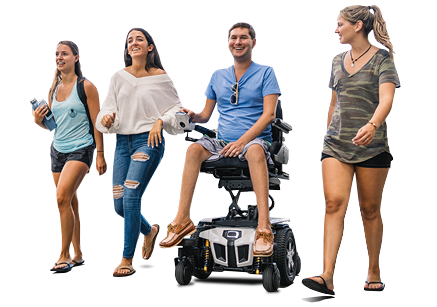 Ondelee is currently being featured in Quantum Rehab's "My Edge" ad campaign. Click here to view the ad.